If You had To Choose 5 Flies, What Would They Be? 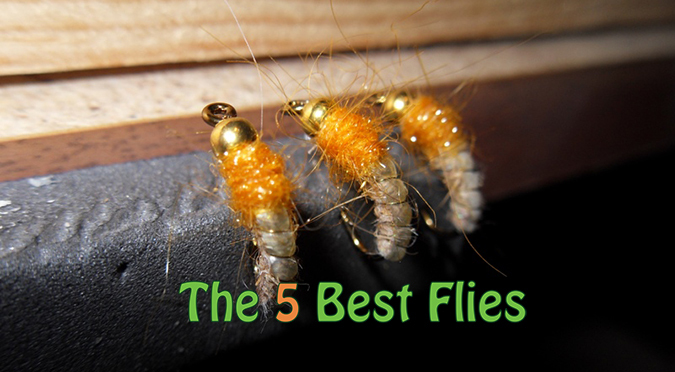 Choosing 5 Flies: If You had To Choose 5 Flies To Fish With, What Would They Be? Basically the exercise is that you have to choose 5 flies that you would fish, for the rest of your life, whether it be stream, lake, estuary etc. 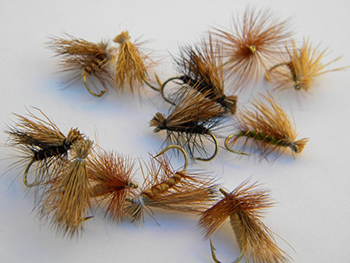 Now this is very challenging, but quite fun, I will post Mr. Tom Sutcliffe’s results after I have chosen my 5 preferred flies, if we could call them that, and we can see how similar they are in the end. The Black Woolly Bugger – One of my most used flies and my go to fly when fishing a sinking line when nothing else is working. I have landed and lost many big trout on this fly. The D.D.D. – A Tom Sutcliffe invention. My favourite dry fly and my first dry I will cast during a rise or a sight fishing outing, superb fly. The G.R.H.E – This is my favourite nymph and will not go to any body of water without it. The White Fritz – Another wet fly, but more of an attractor pattern, I have caught many types of fish on this fly, saltwater and freshwater included. The P.T.N. – A tossup between this and the R.A.B., but I had to choose another nymph, I have had success on a black PTN in rivers, streams and stillwaters. Black Woolly Worm, similar to my selection of the Black Woolly Bugger. Gold Ribbed Hares Ear, another same selection, very interesting. Adams, I chose a White fritz, as I love my wet fly fishing and getting some reaction takes. But I nearly went with the R.A.B., which in principle, is a similar type of fly to the Adams. Black Suspending Midge Pattern, I chose a Black PTN, very similar once more. The result of this exercise? Surprisingly, the results are nearly identical! I never turned the page and we chose similar flies, except for the last of our choices. There might be something to this 5 fly method after all. But I don’t think I will or could be one of those fishermen, I love so many aspects of fly fishing, I have to have a variety of flies, even if most of them are just pleasing to look at.